In 1985, the movie Clue managed to something incredibly difficult: it turned a classic board game into a compelling movie. Simply making flattering comparisons between it and the Rhianna-fied Battleship is too low a bar. 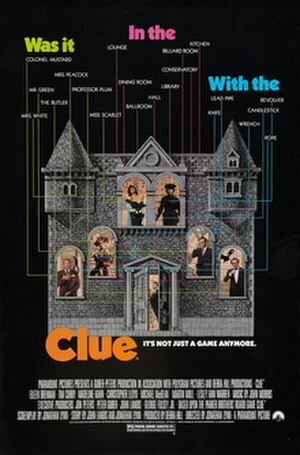 Instead, consider how impressive it is that Clue succeeded in translating a roll-the-dice-and-move, logical deduction game into a story more watchable than the spate of films based on mission-driven video games (e.g., Prince of Persia, Hitman, Max Payne). The casting and most of the memorable lines would suggest that Clue was a straight-up comedy. What else could you possibly be setting out to achieve by gathering Martin Mull, Christopher Lloyd, Madeline Kahn, Michael McKean, and Tim Curry into a single film? The success of the comedic material, however, can almost make us forget that the writers and performers also managed to entangle viewers in a legitimate murder mystery with an ending less obvious than many. Of course, that’s partly because Clue had three different endings–a nifty box office gimmick that also served as another smart reference to its derived-from-a-board-game status. Any player could be the murder in any given game of Clue, so why should the movie resolve who the murderer is once and for all? This Wednesday at 10 pm the TV mystery series Psych will mark its 100th episode with an elaborate homage to Clue. (If you’re not a Psych fan, think of it as the funnier, hipper big brother to The Mentalist.) The film’s Ms. Scarlet (Lesley Ann Warren) , Col. Mustard (Mull) and Professor Plum (Lloyd) will appear as guest stars in what looks like a promising night of cheeky cultural references. In a nod to Clue‘s as-far-as-I-know unparalleled stunt of distributing three different endings for their whodunnit movie, Psych is pulling together its own innovative trick: USA is inviting viewers to vote live online to determine their episode’s ending. If you watch Psych, even casually, boning up on Clue is certain to get you more out of episode 100. If you don’t watch Psych, I submit that you should still queue up Clue. It’s 90 minutes well-spent in a world now all too often overrun by bloated 3 hour action adventures. It’s “instantly” available on Netflix and Amazon Prime members can stream the 1985 gem for free.